These well-established, individual apartments and studios are attractively set on terraces within beautiful large gardens of 20,000 sqm, with full grown trees, high above the bay of Istro, and as a result have stunning panoramic views. It is 1200 metres to the village, and 600 metres to the nearest beach. There is a beautiful swimming pool of 130 sqm, with a shallow end for children, set in large lawns on a separate raised terrace reached by a short flight of stone steps, and well equipped, with sun beds and sun umbrellas. All apartments have recently been refurbished with air conditioning, satellite TV, hairdryer and safe. A: Two studios for 2-3 people having a double bed and a single bed, which is somewhat set apart in a corner, kitchenette, shower/wc, and sun terrace with wonderful sea views. 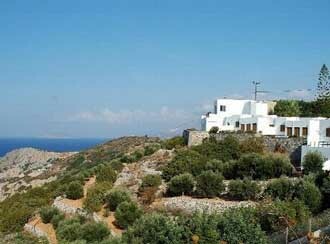 B: Five maisonettes, about 50 sqm in size, for 2-4 people having a living room with 2 sofa beds, kitchenette and veranda on the ground floor and a wooden staircase leading to a bedroom with a double bed, hip-bath/shower/wc and balcony on the first floor with magnificent unbroken sea views. C: Four split-level apartments, about 50 sqm in size, for 4 people. A short flight of steps leads to the two bedrooms, which have traditional built-in twin beds. Further there is a dining kitchenette, bathroom/wc, some of which have a small bath, and a large balcony terrace with beautiful sea views. D: One newly built apartment, built in 3 split levels, about 55 sqm in size, for 4-5 people. This apartment is situated on the highest level in the middle of the complex, and affords breathtaking views over the Mirabello Gulf from all directions. It has two bedrooms (one double and one twin), a living/dining area with kitchenette, comfortable seating and extra bed (if needed), bath/wc, and two balconies with panoramic sea views. All windows are fitted with mosquito nets.